With the help of Steve Harvey and Disney, Tracey D. Powell is helping 100 high school students turn their dreams into reality. Each year 100 high school students are enrolled in the Disney Dreamers Academy, a weekend of inspiration and education at Walt Disney World with ESSENCE and Steve Harvey. Tracey D. Powell serves as Executive Champion for the program and has worked as an executive at Disney for more than a decade. See how she manages a team of 9,000 at the happiest place on Earth and her top tips for big dreamers. The gig: As the Vice President for the Deluxe Resorts at Walt Disney World, I am working to bring all of our seven luxury resorts to the next level including the Animal Kingdom Lodge and Grand Floridian. I have about 9,000 cast members that I’m responsible for. 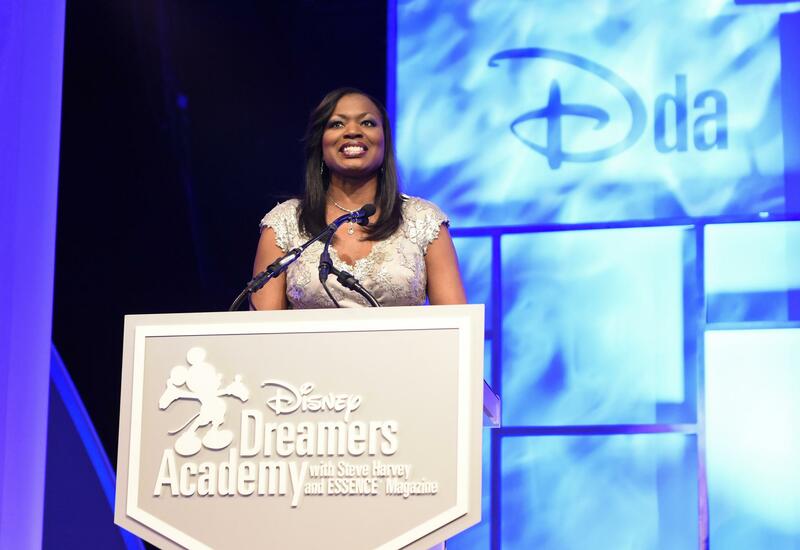 When Disney started the Disney Dreamers Academy with Steve Harvey and ESSENCE seven years ago, I was honored to be the Executive Champion and help select and mentor 100 students to come to Disney each year. This is my true passion. The journey: I went to Indiana University for my undergrad. Right out of college, I took an entry-level financial analyst role at Carnival Cruise Lines in Miami and I was there for 13 years. I later got my MBA in Florida. Through my process and journey I became an executive and was responsible for the pricing for all of the cruise ships for Carnival Cruise Lines. Her dream epiphany: Coming from Gary, I never came down to visit Orlando, so it was to by the grace of God that I was led to Disney. Coming from the Midwest, I always thought that I would work for a manufacturing company like GM or Ford. If you’re going to dream, be open to anything because you just never know what that next step is. Never have boundaries on your future. Her strategic move: Even though I was an executive at Carnival, I intentionally took a step backward to join Disney in 2002. I took a role as Senior Manager for Resort Pricing. I got to work and in 2004 I was promoted to an executive. I was later promoted to Vice President of Global Initiatives and Integration and had direct responsibility for our Asian sites. We opened Hong Kong Disney and I went back and forth to Hong Kong to help them kick off. We also opened in Hawaii. Ten months later I was asked to take this role. It’s a huge responsibility and I don’t take it lightly making sure each and every guest has the right experience. Confessions of a Black businesswoman in Asia: It was very different from an African American prospective. The Asian culture is very diverse. So, in Shanghai and Hong Kong the culture is very specific. You have to be very aware of the differences. You can’t go to blanket statement that I’m in Asia so everyone is exactly the same. In Asian culture they are very respectful and courteous, which is wonderful. From a leadership standpoint, you have to make sure things are clear and reiterate. Her biggest lesson learned: In the beginning of my career it was really important to be able to get to the right outcome. I didn’t always realize that that job has to be done through people and that could be at any level, whether the people that I report to, my peers or those that report to me. I always advise those that are coming along in their careers to not underestimate the power of people. Her boss secrets: I’m continuing to develop servant leadership and talk to people on every level of the organization. Last Christmas I was new in my role and went to every resort and gave out cards and candy canes to our workers. They had to be away from their families for the holiday making sure our guests are having a great time. It was important for me as the Vice President to make sure that they knew we appreciate everything they do. Her work/life strategy: I’m married and I have four children so my family is extremely important to me. The good news is I work in a great place where it’s easier to integrate my family into what I do. You have to be very deliberate to be able to find and strike that balance. My husband and I are both busy but are intentional to have a date every week. Her beauty bag: I’m totally a MAC girl. Her boss accessory: If I’m going into a big meeting, I make sure I’m prepared on the inside, and look prepared on the outside. I’m a big accessory person and love a necklace. How she unwinds: I go to a spa. Disney has some phenomenal spa experiences and you get treated like a queen. I also love to spend time with my girlfriends. Follow Disney Dreamers Academy on Twitter.